Monkey chants were heard from the crowd in St. Petersburg on Tuesday whenever black French players touched the ball in a friendly against Russia. 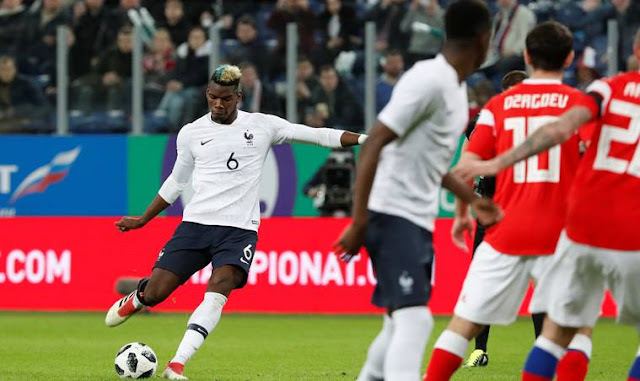 The abuse was also audible on a TV broadcast after Pogba scored France’s second goal in a 3-1 win. Barcelona’s Ousmane Dembele was also subjected racist taunts. The incident sparked calls to persevere in the fight against racism in football with less than three months before the World Cup. FIFA said in a statement that it was collecting evidence and would contact the anti-discrimination Fare Network, which helps world football’s governing body investigate racism cases. It’s the third racism case this season at St. Petersburg Stadium, which will host a World Cup semifinal. Zenit St. Petersburg has twice faced UEFA charges for racism by its fans in Europa League games. Last year, Zenit were ordered by UEFA to partially close their stadium after fans displayed a banner praising former Bosnian Serb military leader Ratko Mladic, a convicted war criminal.